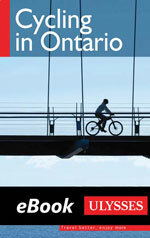 Cycling in Ontario describes 165 cycling routes covering 5,567 kilometres within Ontario, including the Trans Canada and Waterfront trails. It features 30 of the province’s best rides, with listings of attractions, accommodations, dining and services you’ll discover along the way. Cycling in Ontario identify our favourite trails and custom tour for culture and history buffs or those who enjoy riding through forests and wetlands or past spectacular waterfalls and scenic views. It includes everything, from transportation options and tour difficulty ratings to climate and bicycle maintenance, to enable you to carefully plan your cycling adventure. Clear maps and directions keep you on the right track and help you get the most out of your outings.